I retired from the Coast Guard as the Project Manager for CG-LIMS, which is a technology refresh of our legacy logistics systems using Oracle E Business Suite. I'm incredibly proud of the work the development team is doing using an Agile Scrum methodology to deliver capability in two-week sprints. This is a walkthrough that showcases some of the capability in the first release. This is a quick and dirty demonstration of CG-LIMS prepared for executive Coast Guard leadership showing some of the capability delivered in CG-LIMS in Release 2 and 3. I managed the $12.3M project to deliver a system that manages operations and logistics for Coast Guard's fleet of 200 aircraft. The system later became the foundation of the Coast Guard's Business Model and was linchpin of Coast Guard Logistics Modernization Strategy. It is is now used every day by everyone who operates or maintains any Coast Guard aircraft or standard boat. In 2001, I briefed the Coast Guard Commandant and Executive Leadership in their weekly "2 1/2 Minute brief." At that point, we had rolled out initial capability, so I briefed them using a demo of the live system I had recorded ahead of time. The audio was added later and matches what I said at the time. 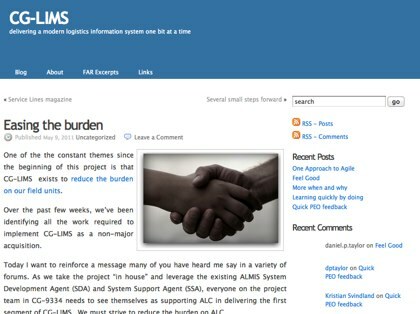 While I served as the ALMIS Project Manager, I created what we would now call a blog to align the development team and engage with the folks in the field who would use the tool we were creating. It turned out to be a fantastic change management tool. We retired the original site, but I later hosted it on my own server so I could continure to share the things we learned during that period. The content was later deleted at USG request. 2003 Innovation Expo Speech: "(W)e Coast Guard"
I used this talk to share some of the lessons learned as we developed and delivered ALMIS. I kept up blog to keep my team and all stakeholders aligned and informed. This time I didn't have to write the platform myself. I relied on the WordPress capability on Intelink-U. Once we got to the point of communicating with industry, I began exporting the blog to a public WordPress site so everyone would have the same information. In 2009, I was briefed the Commandant and his staff on the project I managed. Although the scope was later decreased to execute the project in smaller chunks, the value proposition is remained the same. These are the slides I used. I added the audio afterward. In response to OMB pressure to reduce the size of Federal Government IT projects and internal budget pressures, we had to change the delivery strategy to develop was affordable and executable. I created a GSA-hosted wiki to invite all stakeholders, including contractors, into the conversation. I'm proud of this as an example of putting simple collaborative tools to use to better serve our customers and do the best as stewards of the taxpayers resources. In July 2012, GSA discontinued support for http://www.citizen.apps.gov/. You can download a PDF export of the CG-LIMS wiki from June 2012. Or take a trip in the Internet Wayback Machine and check it out. As part of the decision process to select an affordable and executable acquisition strategy, the team devloped a model using a software tool called Expert Choice. I created a screencast to share the results with all stakeholders. This slide deck is the best "soup-to-nuts" description of what we're doing. It was designed to provide the whole big picture view before the team went about the business of configuring Oracle E Business Suite. Guest Appearance on Federal News Radio's "Dorobek Insider"
I appeared as a guest on Christopher Dorobek's "Dorobek Insider" on Federal News Radio 1500 AM to describe how we used social media throughout the CG-LIMS acquisition project. 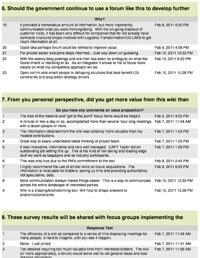 I framed the acquisition strategy wiki as an experiment that we'd evaluate three months after starting and decide whether or not to continue. One input to that decision was a survey of the participants. The feedback was overwhelmingly positive. I shared all the results with a GSA-led team on which I participated to develop a government-wide platform for pre-RFP collaboration with industry. This was part of then Federal CIO Vivek Kundra's 25 Point Implementation Plan to Reform Federal Information Technology Management.